(Lanka-e-News - 12.March.2018, 6.30PM) The media recently reported on how president Sirisena created a volcanic eruption to raise a tiny mouse pup, which too he failed to realize is paralyzed until it was too late. The cabinet reshuffle drama took place in the wake of the president Sirisena’s ‘shadow cabinet’. Now Sirisena has a ‘shadow cabinet ‘ which fits more the description , ‘kitchen cabinet’. In this cabinet is a group including Gotabaya Rajapakse , Susil Premajayantha , Weerawansa, Gammanpila, Dallas ,Mahindananda , Shiral Lakthileke, Maithri Gunaratne , Rathane Sadhu , Nivaard Cabraal and Roshan Ranasinghe who are all expected to wash pots and plates , and dirty linen ?The decisions regarding the law and order ministry and the no confidence motion against Ranil Wickremesinghe were all arrived at by this shadow cabinet. This mouse pup, president said is paralyzed when the cabinet reshuffle was completed only by the UNP faction. The currently 4 % precariously placed executive president’s faction however has still not followed suit though it was expected and there are no signs of that taking place . Whether the ‘4% president’ will do that or not cannot be said , revealed minister S.B. Dissanayake at a media briefing. The ‘4 % president’ ought to be reminded , his high handed action according to his own whims is despite his executive power being curtailed under the 19 th amendment . Why was Madduma Bandara granted the law and order ministry ? Madduma Bandara is one of those who leads the anti Ranil UNP group . He was one who was in the frontline of the team of hooligans including Sajith , Shiral Lakthileke ( notorious NGO crook) and Maithri Gunaratne when they attacked Sri Kotha .If Madduma Bandara becomes the law and order minister , it is obvious Shiral who will hold the reins controlling Madduma like the Bullock cart driver controlling the bullock. In the circumstances one can guess whether cases will be filed against the criminal members of the shadow cabinet whose names are at the top of the list of Gota group of the Rajapakse Co. with whom president Sirisena has sought n alliance . Indeed, the first statement made by Madduma after taking oaths was , “the opposition had nothing to do with the anti Muslim attack launched in Kandy’’, though this was totally contradictory to what Rajitha Senaratne disclosed ,and even diametrically opposed to the cogent and copious evidence available with the police. It is deducible from the Madduma Bandara announcement he was aware he was getting the post even before he was sworn in. It is why Roshan Ranasinghe of the Gota team wished Madduma Bandara well before the media over his new appointment. “He is a very nice person. We expect him to discharge his duties impartially . We wish him well” said Roshan. Yet the group of Basil did not convey any greetings to Madduma. It was the belief of Basil team , until the last moment Fonseka would be appointed to that ministry. It is well know though Basil and his group collected illicit commissions , they did not commit cold blooded murders after forming murder squads. Hence , if Fonseka became the law and order minister , that won’t be much of an issue to them . However , to Gota and his group it could pose a huge issue, because they would all be hauled up in courts for their heinous crimes. It is the aim of Basil’s group to destroy the Gota –Sirisena alliance which is most portentous and spells doom not only to the entire population but also to the entire country. In any case Madduma Bandara who was granted the law and order ministry is suffering from cancer and was undergoing chemo therapy treatment necessitating him to keep away from Parliament for many months. Even now he is under treatment to keep him alive. Surely such a patient cannot shoulder such a ministerial responsibility which demands him to spend all his time on the onerous duties. Madduma Bandara should understand this first . Next Ranil should and providing national security and peace to the country is not president’s or P.M.’s 8 th floor privilege , rather it is a national responsibility. It is not known whether both of them are trying to understand this only after going 6 feet underground ? No confidence motion to chase out Ranil …. The UNP members’ name list of the no confidence motion against Ranil was handed over to Gammanpila by president Sirisena. Range Bandara was a key player. The task of collecting the signatures of the UNP members was entrusted to Range Bandara , and the kickback for that was law and order ministry. Wimal and Gammanpila , have then met Mahinda Rajapakse to obtain permission to collect the signatures of the alliance members. Mahinda who heard of all this ahead and was in a fury had torn the no confidence motion document and thrown it away. ’Are you all doing this in your madness? At this juncture can we take over a government and go on ?After asking whom, are you all doing this ? Mahinda had questioned while launching his verbal onslaught in a fit of rage. Basil who interjected had said , every one of you keep in mind all the votes flower bud polled are because of president Mahinda. Hence don’t get ready to form groups according to your fancies and try to trespass on your limits. In the commotion , Mahinda had taken a phone call to Ranil and openly said ‘ The UPFA has not taken any decision to bring a no confidence motion .That is a move of UNP group and Sirisena.’ Mahinda made these comments publicly to hit at Gota , and to quash the Gota- Sirisena conspiracy. Under the circumstances no confidence motion against Ranil is not going to be tabled. Why is Mahinda group fearing to take over the government ? The Basil group is not ready to take over the government not because of any ‘deal’ with Ranil , but because of the advice proffered by P.B. Jayasundara. ‘ We are fortunate we lost in 2015. Otherwise it is we who would have had to face the opposition of the people. It is this year and next the biggest loan installments have to be paid on the loans we took , in which event the government will be forced to burden the people with more taxes, and make cut backs on reliefs provided’, P.B. has elucidated. Basil listening to this had replied , ‘yes at this moment what we should do is not to embrace the government but exploit the situation to prepare our party for the next elections.’ Mahinda too had concurred in it while saying most angrily ‘ Our Gota cannot understand this. He is swallowing the ‘dead ropes’ of Wimal and Gammanpila. Though Wimal and Gammanpila are making a a big din about the proposed no confidence motion , it is as sure as the sun rising from the East , that the UPFA will not table a no confidence motion against Ranil or the government within the next 2 years. Yet Wimal’s website which is best noted for the worst falsehoods , is continuing to post all kinds of concocted and malicious stories . Of course there are also the media personnel under the pay of Gota who are giving publicity to these mendacious reports. These are the media scoundrels day dreaming to become the chairpersons of Gota’s government media Institution . Dejected Sirisena’s call rejected by Mahinda .. Meanwhile president Sirisena invited Sarath Fonseka and had a discussion pertaining to the ministry of law and order. Mahinda group of curse came to know it was a ploy to frighten Basil. It was the opinion of Basil’s advisors that this situation must be made an opportunity to skirt around , and cripple the Maithri –Gota relationship , and through Mahinda they propagated the view. The media reported on the 7 th regarding the discussion held by Mahinda with several front line media personnel on the 6 th in this connection At the discussion Mahinda stated , ‘All are saying I am scared if Fonseka is coming. I am not frightened , the prevailing fear is that he will put Gota behind bars. If Gota is to engage in politics he must g to jail. If my young children can get remanded , why shouldn’t Gota? Gota’s ‘cabinet ‘ begins to function..
Mahinda is enraged at Gota because the latter is forming committees after gathering various individuals , and going ahead. Recently at such a committee meeting Dr. Nirmal Ranjith of the Colombo University came in for heavy flak from Gotabaya . That was because Nirmal did not carry out a responsibility entrusted to him at the previous committee meeting. Subsequently ,the views expressed by Nalaka Godahewa received a huge applause. It was Dilith Jayaweera , owner of Derana media chain who spoke next after almost forcibly wresting the microphone . His speech was not well received by the audience , and provoked many criticisms. ‘He was with us and then aligned with Ranil. Now he comes here to tell us how to make you (Gota) the president in 2020. If Flower Bud has not won , he would still be with Ranil.’ When he was so criticized Dilith was in a most embarrassed situation. Gotabaya then said ‘ that is the way with businessmen’ in a lighter vein to calm the audience. President Sirisena announced recently , ‘two Presidential Task Force ‘ for North East development , over and above the P.M. who has the majority in parliament . Interestingly that was a decision taken by Gota’s ‘cabinet’ which also stated this should be implemented in line with ‘Uthuru Wasanthaya’ of Basil. Sangha underground criminals split into two…. When Mahinda did not fall into any of the traps of Sirisena, the latter in anger and anguish put in place another plan. That is to win over the Sangha underground criminals of Mahinda, and thereby split the Sinhala Buddhist racists and religious extremist forces , to take them into the fold of Gota. These were decisions reached by Sirisena’s ‘Shadow cabinet’. The first step in this direction was summoning Batticaloa Mangalaramaya Sumanaratne Lankara. The latter challenged Sirisena and hoisted black flags based on a copy of a letter written by Shiral Lakthileke. Thereafter Sirisena under the pretext of protecting the life of underworld criminal Sumanaratne went and met him with an ‘atapirikara’ and worshipped him as never before. That was on 3 rd March. Sirisena thereafter stooped so low as to do all the sordid biddings of underground criminal Sumanaratne including implementation of every plan of the latter , however evil and sinister. 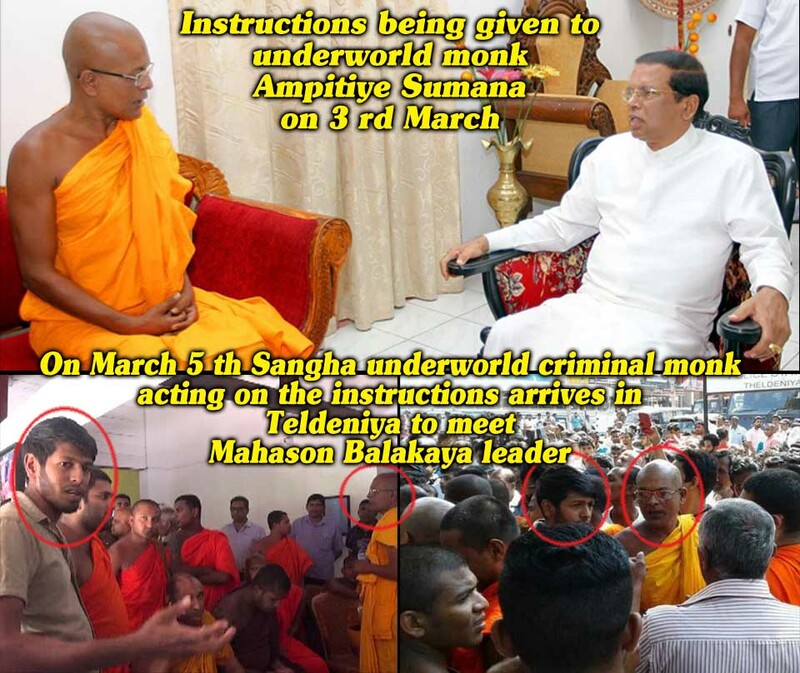 Gnanassara considered as Sangha underworld godfather and an old friend of Gota , and Sangha underworld criminal leader Sumanaratne met to plan the attack on the Muslims. The disgraceful disdainful video footage of what Sumanaratne , other Sangha underworld leaders , and leader of Mahason Force leader Amith Weerasinghe did and said after assembling at Teldeniya police can also be viewed with your own eyes. President’s former security chief S.M. Wickremesinghe is currently the Central province senior DIG. Since the combined dream of Sirisena –Gota is to make Gota the president in 2020 ,and to curry favor with the sinister Buddhist forces , the Sangha underworld and Mahason Balakaya found the right climate an opportunity to go on their rampage setting fire to Muslim establishments and launching attacks on Muslims unhindered for several days in spite of the curfew in force. In the circumstances , the sinister Sangha underworld is undoubtedly going to be more bold and strong in the future in the evil direction. After all this mayhem, who were the companions in Sirisena’s helicopter journey to Kandy? It was none other than the lyricist ,another Sangha underworld criminal Elle Gunawansa who wrote military poems for Gota’s war . The other was Weerawansa’s Ravanabalakaya’s Ittekande Sadhatissa. The third sangha underworld criminal was ,Gota’s lackey Medagoda Abayatissa. The current despicable friendship between Sirisena and Weerawansa as well as Gota’s atrocious schemes can be gauged by viewing the website of Weerawansa. It is significant to note though Lanka e news which is for racial amity and against racism in the best interests of the country is forbidden within SL , Weerawansa’s villainous website openly and most outrageously stoking racism and communal hatred thereby deliberately driving the country into a holocaust has not been banned. There is an information chain of Mahinda that conveys all the information and plans of Sirisena-Gota. Acting on that Mahinda through the Asgiriya chapter had met all the Buddhist prelates of Kandy with Lohan Ratwatte and proved the latter was innocent. That is why Mahinda is accusing the government and not the police as responsible for this racial violence. No matter what Maithri has only one and half years left . Besides he is on a precarious 4% popularity . Now that his mask is getting torn off and his true colors are becoming known , Buddhist prelates who steered him to power are themselves forced to use the epithets ‘pathlolaya’(worthless useless being) and murderer to describe him and even go as far as to tell him ‘ if you cannot do your job properly , please get out.’ If patholaya heeds the request ,the people too will heave a sigh of relief because they are earnestly waiting for the day to say GROBR (good riddance of bad rubbish) to Patholaya Sillysena.